It comes with a regulation boxing ring, jacuzzi and a carriage house with multiple rooms for guests. If you’ve got over $2.9million (over R39 million) then you could own the former home of the late, great, legendary boxer Muhammad Ali. The 32 000 square meter estate where he spent time with his family and was a refuge from paparazzi is currently for sale by Ali’s widow, Lonnie. The property was purchased by the heavyweight champion in 1975 as a place to spend summers and eventually retire. fire pit, and a pool with a bath house and an outdoor kitchen. The main house features four bedrooms and two full bathrooms, what the listing calls an “expansive”living room, a family room, a kitchen with imported tile and a large pantry, and a three-car garage. The carriage house has many rooms for guests to stay in, plus there’s also the sun room and deck overlooking the river, pond and fountain. But if you’re a boxer too, or just want to buy the house for it’s link to boxing history, then the real draw for you will be the private gym with the full-size, regulation boxing ring plus training equipment, training tables, a steam room, private baths, a massage room, laundry, and a jacuzzi. 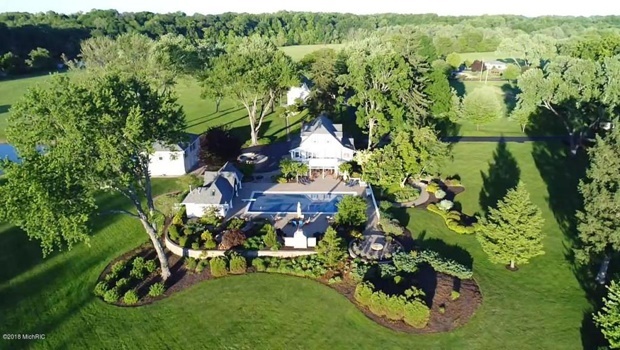 Although the property wasn’t used by the Ali family for several years, the listing ensures that the property is in immaculate condition and has been maintained by the same groundskeeper for more than 15 years. For more information about the property and to view photos, check out the listing on Cressy & Everett Real Estate.